In the past five years, nine young residents of Mer Doon have been married. Prior to forming their own families, the young ladies had outgrown orphanages and found a home at Mer Doon that fostered their education in a loving and compassionate family environment. Throughout their stay, they were backed by the support of benevolent individuals and organizations, among which is FAR. Two of the latest Mer Doon marriages were celebrated at the end of last year. Two girls, Gohar and Tehmine got married on the same day: December 29, 2012. Gohar Gabrielyan had lived in the Gavar boarding-house through 2006, after which she was placed in a foster home until 2011. She then found herself at the FAR Children’s Center where she received social-psychological rehabilitation assistance. Thanks to FAR’s consistent support through the Gulamerian Scholarship Program, Gohar attended vocational training courses at the “Varpetats Tun” Specialized Educational Center. Around her 18th birthday in 2012, Mer Doon welcomed her as a resident, where she continued the vocational courses and acquired a professional hairdressing degree. 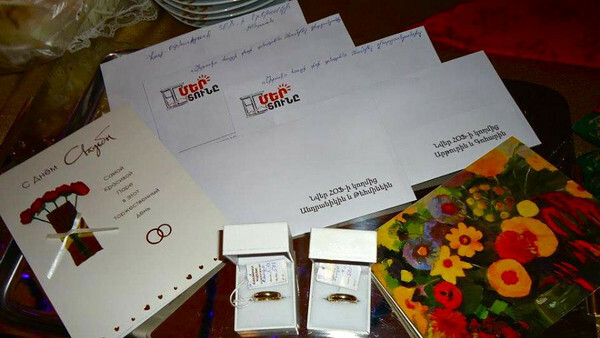 Tehmine Araskhanyan was one of the beneficiaries of FAR’s Gulamerian Scholarship Program in 2008. Upon graduating from the Tevanyan Politechnical College in Vanadzor in 2012, she relocated to Mer Doon. There, she continued her studies at the Grigor Lusavorich University of Echmiadzin. She’s currently a 1st year student in economics. All of us at FAR share the joy and happiness of Gohar and Tehmine. We are glad that fostering all Mer Doon residents’ professional education through the Gulamerian Scholarship has been a significant driving force for them in establishing themselves as professionals. It has also allowed them to find the jobs that they now have in order to sustain their new families. We believe that providing equal opportunities for the less privileged in a society is most fruitful when it allows them to lead lives in which they no longer feel less privileged than their peers. It is with this viewpoint that they can confidently step into the next stage of their lives.